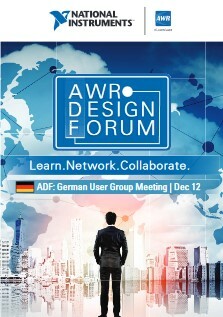 El Segundo, California, December 5, 2017 - The agenda has been finalized and registration opened for the combined 2017 AWR Design Forum (ADF) Germany and German User Group meeting, taking place in Munich on December 12. ADF brings the latest NI AWR software solutions to customers, partners and engineering professionals throughout the world, enabling them to learn, network and collaborate on today's microwave/RF design challenges. The event is free to attend but seats are limited. Advance registration is required. For additional information and to register, visit awrcorp.com/adf.